Financiele Diensten Amsterdam (FDA) has been providing investment advice based on a combination of independent equity research and macroeconomic analysis to investors since 1986. Unbiased: FDA is completely independent and free of potential conflicts of interest. Our customers pay directly for our advice and research. We do not have a brokerage arm or derive any revenue from the transactions of our clients. Focussed and Reliable: FDA strives to produce research of the highest quality, focusing on a carefully selected universe of international blue chip companies. Transparent methodology: investment choices are reflected in a straightforward risk/return matrix that at any given moment reflects our preferences across the research universe. Responsible: corporate responsibility assessment is an integral part of our analysis of a company. Affordable: the remuneration is based on returns, ie the value created by FDA for the client. 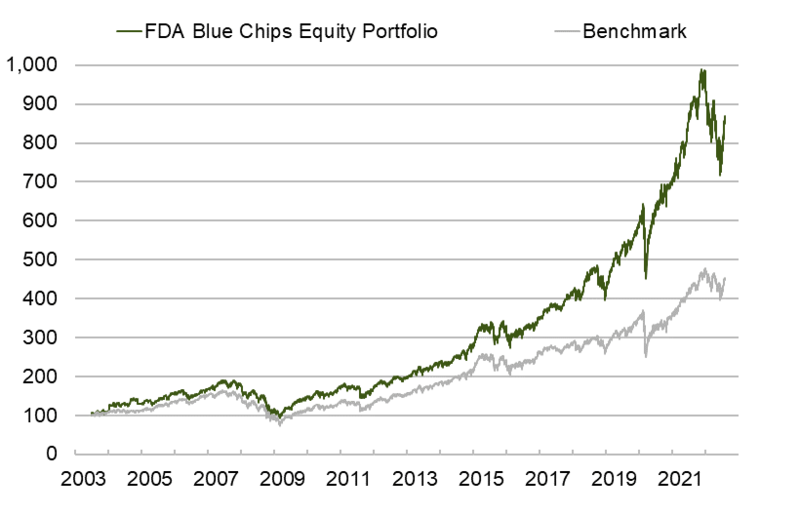 The value-added of our research is best reflected in a disciplined investment process and the strong performance of our portfolios, including the FDA Blue Chips Equity model portfolio. *** Turnover is the value of sell transactions divided by the average value of the portfolio over a given period. All portfolio changes are motivated to provide optimal transparency. Last week new details have emerged on the alleged illegal marketing practices in the former prescription drug business of Reckitt Benckiser. These details follow upon earlier incidents and setbacks that have weighed on the company's sales growth for the past two and a half years and further suggest shortcomings in risk management. Reckitt Benckiser's new Chairman has taken measures to improve risk management while the implementation of a new business structure enhances focus and reduces complexity. The firm still has ample opportunities to further expand its market share in the consumer healthcare segment at the expense of rivals with less consumer marketing expertise. Nevertheless, near-term risks remain high before the implementation of the improvement measures start to have an effect. In addition, there are lingering uncertainties about the settlement of the outstanding legal liabilities. The shares have been sold from the portfolio. In 2006, several seasoned payment executives founded the Dutch-firm Adyen to take advantage of the changes that the shift towards ecommerce would bring to the payments landscape. The firm's payment platform was built in-house with scale and flexibility in mind and specifically designed for the needs of large ecommerce players that sell across markets and sales channels. This has allowed the firm to quickly gain share from incumbents that mainly focus on a specific region. The payments processing market remains fiercely competitive and is changing fast while several incumbents have merged to better compete with smaller and more nimble fin-tech rivals such as Adyen. Nevertheless, the online payments market continues to grow fast while Adyen is likely to be able to innovate faster than incumbents that are hampered by legacy software platforms and complex integration processes. Moreover, Adyen is increasingly successful in the in-store payments market, which will be critical going forward as the lines between online and offline commerce are blurring. The shares have been added to the portfolio. RELX has successfully transformed its business profile from a traditional publisher to a digital supplier of professional information and analytical solutions, while maintaining a solid base of recurring subscription sales. This has resulted in growth in underlying revenue and in adjusted operating profit across its business divisions. The company's massive library of data and research that it has gathered over the years represents a strong competitive advantage, which can be monetised further with the current strategy. In addition, the improved financial position can be used to acquire database assets or analytical firms. The stake in the portfolio has been increased. Through ongoing investments in the expansion of network infrastructure and aircraft fleet renewal, Deutsche Post remains well positioned to benefit from opportunities resulting from growing world trade and rising e-commerce activities. At the same time, the management is taking measures to improve profitability by increasing its focus on IT infrastructure and analytics. The stake in the portfolio has been increased. Profound changes have taken place in the media industry over the past decade, requiring many incumbents to rediscover their business models. Among the players historically dominating the television and movie sector in the US, Walt Disney is seen as a company with the strongest potential to be able to successfully make a transition. Its intellectual properties are popular globally, it has recently acquired attractive assets from Fox and its financial position is sufficient to support the necessary investments. The transition will nevertheless be a realized in several years. The stake in Walt Disney is increased.